Back A Cactus Odyssey. Journeys in the Wilds of Bolivia, Peru and Argentina. James D. Mauseth, Roberto Kiesling, and Carlos Ostolaza. 2003. Timber Press, Portland, OR 97204 USA. 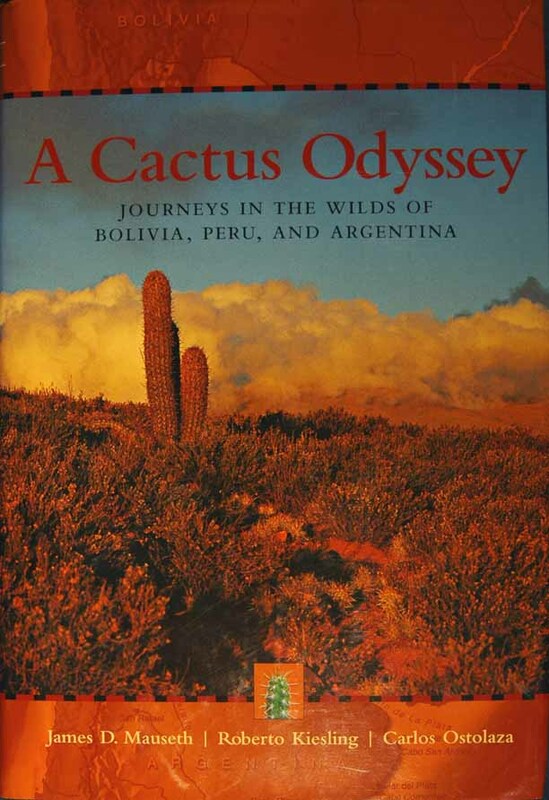 This book was written as a series of field trips that we took to collect cacti in South America. It tells a bit about the geography, climate, flora and fauna along the routes, as well as some of the more interesting hotels and restaurants. Each time we stop for cacti, the book discusses some interesting point about that species or about cactus biology in general. It is intended be a book that you can just sit down and read from cover to cover but at the same time you will learn a lot of biology. Chapter 1: Cacti: Introduction, Biology and History. Chapter 2. Lowlands of Eastern Bolivia: Cacti in the Forest's Shade. Chapter 3. Highlands of Central Bolivia: Rain, Desert, and More Rain. Chapter 4. Northern Peru: Fog on the Coast and in the Mountains. Chapter 5. South Central Peru: Cacti and Snow. Chapter 6. Southwestern Argentina: The search for Maihuenia. Chapter 7. Northwestern Argentina: Deserts, Rainforests, Mountains and Oreocereus.